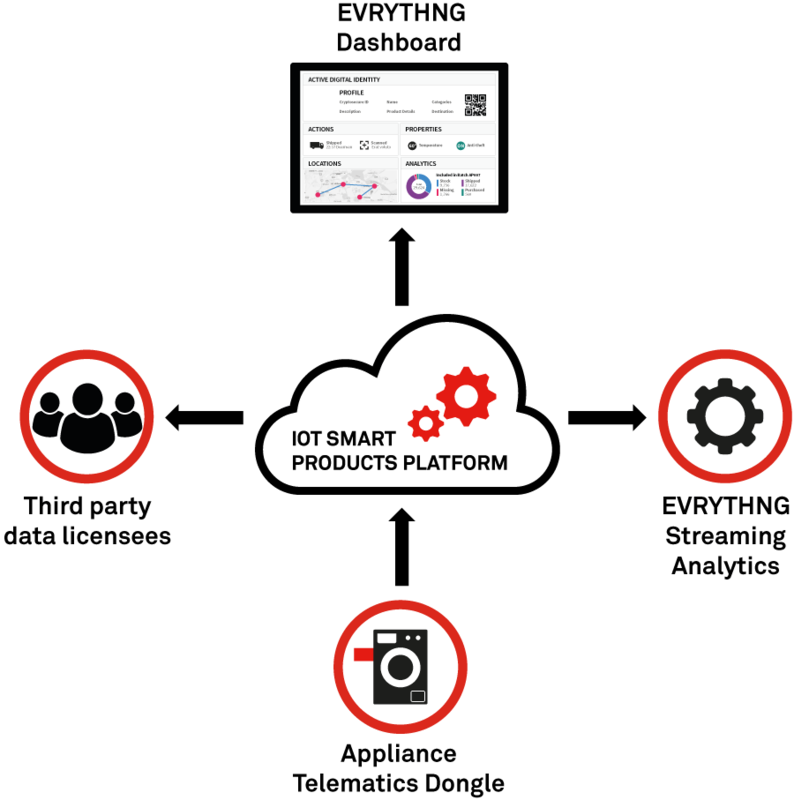 While the reasons for this are important (and were contemplated in a previous post), a highly unfortunate byproduct of the slow rate of IoT adoption by the appliance industry has been the lost opportunity to extract business value from the data these machines would otherwise be gathering and reporting. 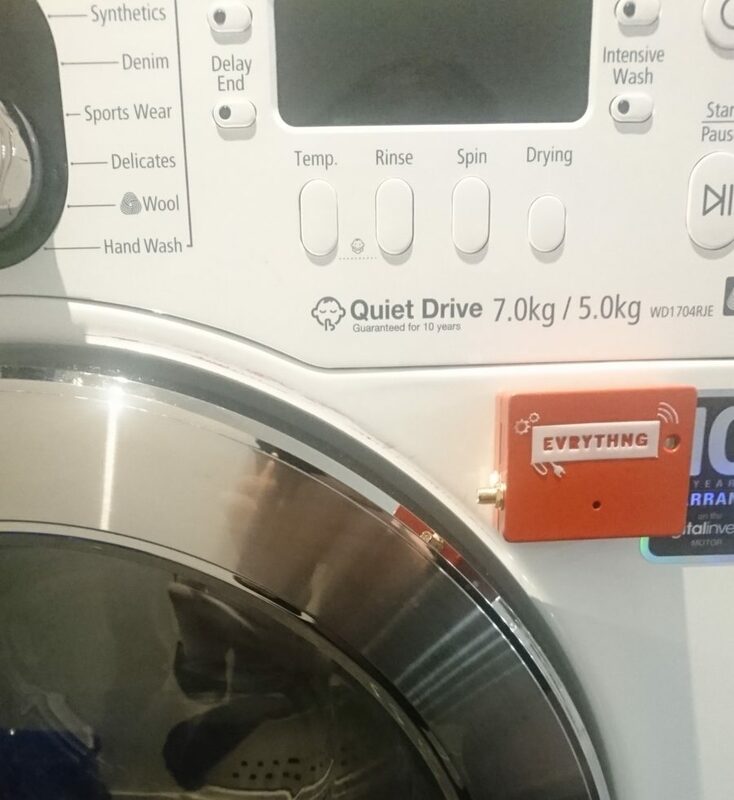 Well, we’re happy to report that EVRYTHNG Labs has developed a solution that promises to unlock this treasure trove of data from the billions of installed appliances around the world, thereby enabling these and many other business opportunities. The solution does not rely on manufacturers to build IoT technology into their products; rather, it’s a low-cost accessory device, paired with EVRYTHNG’s powerful IoT platform and data analytics. We call it Appliance Telematics. Let’s start with the device, which is a small, low-cost, battery powered module that records and reports vibration, motion, sound, temperature, humidity, carbon monoxide, and light as well as other environmental conditions. Importantly, it only needs to attach physically – not electrically – to the appliance and is configured by the owner through a simple web page rather than a mobile application. For connectivity, the device attaches to the Internet over any wireless network – including WiFi, LPWAN (LoRA + SigFox), and 5G as it rolls out – and reports sensor values to the EVRYTHNG platform, which timestamps and stores every data point. From here, two key platform capabilities are applied. All of the data is written to the EVRYTHNG streaming analytics and machine learning engine, where it is used to derive important insights. For example, let’s say that a clothes dryer is taking an increasing amount of time to complete the drying cycle. This could indicate a potential failure mode for which a warranty provider might issue a proactive service call. If the problem manifests across many products, it could also indicate a design or manufacturing flaw to the appliance maker. The retailer who sold the appliance might want to get involved from the perspective of customer satisfaction, and the local utility would like to understand the impact on energy consumption. The platform may be programmed to take actions on events to provide more service value to consumers. Examples include notification that a refrigerator or freezer door was left open; a leaking dishwasher; a stove/oven that was left on; or an out-of-balance clothes washer. Rather than being perceived as a nuisance like many of the notifications we get every day, messages of this nature would likely be highly appreciated. We also envision data sharing partnerships in which, for example, CPG companies could offer Direct-to-Consumer subscriptions for commonly-used replenishables such as detergents and filters. But mostly we are excited to help companies apply new, cutting-edge technologies and methodologies to support their digital transformation strategies, thereby creating value for themselves, their partners, and their customers. If you’d like to learn more, or you are attending CES in January, and would like a demonstration please contact us at hello@evrythng.com.